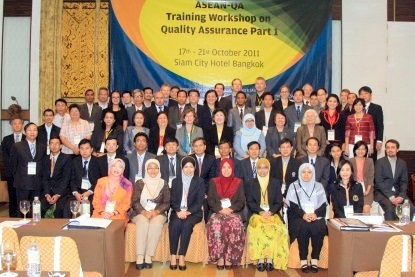 The first phase of the ASEAN-QA Training Course took place from 17th to 21st October in Bangkok/Thailand. Despite the flood in Bangkok and surroundings, all participants and trainers arrived safely at the Siam City Hotel where the Workshop could take place without risks or inconveniences. The welcome reception on Sunday evening was a great opportunity to get to know the colleagues from ten countries in Southeast-Asia. On Monday and Tuesday, the participants learned more about the training course objectives and quality assurance in Germany and Europe and Southeast-Asia, before they split up in two groups until Friday. The internal QA group was represented by 24 participants and the trainer team around expert Ina Grieb (University of Oldenburg), and 17 participants in the external QA track worked together with expert Dr. Iring Wasser (ASIIN) and his trainer team. The first assignment for the IQA participants is to prepare a personal action plan (PAP) and subsequently a Self Assessment Report for the chosen Study Programme for the next phase of the workshop, while the EQA participants focus on the development of criteria for external assessment. Thanks to the preparation of this workshop by AUN, everyone had a pleasant stay in Bangkok and the ASEAN-QA network was not only intensified by the teamwork during the workshop, but also during meals and free time. Participants and experts are really looking forward to meeting each other again in March 2012 in Potsdam/Germany for the second phase of the workshop. ASEAN-QA is coordinated and conducted by the University of Potsdam (Center for Quality Development - ZfQ) within the frame of the DIES programme, which is jointly coordinated by the German Academic Exchange Service (DAAD) and the German Rectors’ Conference (HRK). Partners of the ASEAN-QA Project are the ASEAN University Network (AUN), the Regional Centre for Higher Education and Development in Southeast Asia (SEAMEO RIHED) and two regional networks of QA agencies: in Europe and Southeast Asia: the European Association for Quality Assurance in Higher Education (ENQA) and the ASEAN Quality Assurance Network (AQAN).